My teaching role has primarily focused on general education, advanced undergraduate and graduate level Earth Science classwork, as well as engaging undergraduates in research within my lab. In each of these roles, my primary goal has been to help these individuals make the transition from students who passively receive content to scientists who actively solve problems. Consequently, my teaching involves hands-on, open-ended projects that require students to make decisions about how to define their research goals, develop hypotheses, and to gather and organize data. Thus, the students conduct their own investigations using published data, analog experiments, fieldwork, and in class demonstrations. I emphasize quantitative analysis and require that the students independently develop methods to both gather their data and test relationships among experimental variables after preparing them through a combination of lecture and guided discussion in the classroom. I encourage students to extend their classroom work into independent study. Mentoring students toward scientific independence and informed, critical decision making is one of my primary goals. In addition, I broaden the impact of my research and teaching through outreach to the community. As manipulation of fluid pressure deep in the earth becomes commonplace to supply a growing demand for energy, the public must have the information and understanding to make informed decisions. Such manipulations govern the behavior in a variety of critical systems that have been receiving increasing attention in the news and legislation including: (1) Hydrofracking, (2) Waste Water Injection, (3) Hydrocarbon Production and Enhanced Recovery, (4) “Hydroshearing” in Enhanced Geothermal Systems, and (5) CO2 sequestration. Key concepts appear to be missing or distorted in current discussions concerning human impacts including earthquakes, contaminant transport, and the availability and potential for recovery of resources such as: (1) basic concepts of the scientific methods applied to inverse problems; (2) basic understanding of the geologic and hydrologic context as well as stresses in the earth; (3) the meaning of scientific uncertainty; (4) the scales of pressure and volume change involved in stimulation and reservoir management through the basics of dimensional analysis. I am actively developing outreach that involves hands-on physical experiments with school children ranging in age from elementary through high school to teach these concepts. Teaching gives me a further insight into my research since much of what we discover through research is conditioned by how we define the guiding questions and hypotheses. This narrowing of focus is typically a necessary element of research, but can obscure the meaning of data outliers or the importance of different kinds of data sets. Teaching helps me better understand how I and others think about problems and inevitably students with different backgrounds and perspectives ask questions that reveal my tacit assumptions and challenge me to defend those assumptions and resulting conclusions. This feedback is the scientific process in a microcosm that I try to make visible within classroom discussions of laboratory experiments, data gathering during field trips, and seminar-style discussions of research papers. Making this exchange visible also helps to better engage students, validate their contribution, and realize what a creative processes scientific research is. As a teacher of the capstone class in the Geology major, Masters level graduate students, and a mentor to student researchers, this is the self-critical, independent process that I strive to instill in these students as they embark on their own self-directed study and professional life. My teaching is delivered through a variety of mechanisms. I teach through lecture as a necessary means of communicating the large amount of background information needed to tackle scientific problems. My courses included undergraduate Structural Geology, which serves as the Capstone Class in the Geology Major. I have developed and taught both writing intensive and non-writing intensive versions of this class. At the graduate level I teach Quantitative Structural Geology, and for three years during the summer I taught a condensed Geothermal Borehole Geophysics course at the RES School for Renewable Energy Science, which covered content roughly equivalent to a 10 week class. My lecture incorporates physical demonstrations such as photoelastic and sandbox experiments, discussions of papers from the literature, and reference to my own research to motivate the topic. These all represent attempts to make the abstract scientific concepts both real and applicable, and hopefully to engage students. Science involves defining a question or testable hypothesis, identifying the key data to obtain, and devising a method to obtain the data. As a result, laboratory work and homework is critical within my classes. I split laboratory work within the class into two types: (1) assignments primarily focused on skill development in the lab and as problem sets and (2) open-ended assignments that are driven by the investigation of a self-generated data set. In the former case, basic skills are taught and applied to data sets such as cross-section construction, dimensional analysis, use of stereonets, or deriving least squares analysis and contouring data sets in Matlab. In the latter case, students typically have to apply their skills in a systematic and documented way to investigate a question. For instance, they use a brick-and-slider model to investigate whether earthquakes should be predictable in terms of a few key parameters and to address what it means for an earthquake to be “predictable” – their opinions on this last issue often diverge. For these assignments, the students are typically given twice the time to perform the work allotted for skill-based labs, with some structure provided by turning in a preliminary data set half-way through the time period before moving on to finalizing the interpretation. I also spend significant time teaching students how to properly use and maintain a formal laboratory/field notebook to support their research and refine their working hypothesis. A similar approach is taken on field trips. In the field a typical issue for students is determining what aspect or data to focus on and proceeding from observation to interpretation, rather than jumping to the latter. So in the field we practice recording observations, developing a working hypothesis, narrowing the focus to complete an assignment and then gathering the data and lastly interpretation. Both the laboratory and fieldwork require addressing a research problem within the available time frame and resource limitations, which requires careful management of time and on-going refinement of the working hypothesis as data is acquired. The natural extension of this approach for many students is to conduct an independent study in my laboratory. In these cases I typically work with students to develop a project that either more deeply explores a topic they were interested in from class or allows them to explore a new topic that they might be interested in pursuing (to test it out). An interesting example of the latter was a study of induced seismicity at the Geysers Geothermal Field in California conducted by Emily Morton. She was interested in earthquake seismology, but had no in depth exposure through classroom learning since it is not offered at Temple. 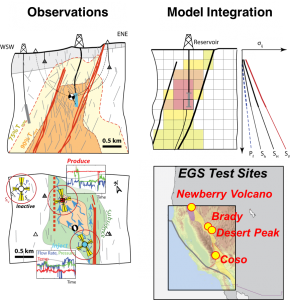 So we developed a project in statistical seismology from a large data set obtained through Lawrence Berkeley National Laboratory from the local seismometer array at the Geysers and from pumping records available through the California Energy Commission. I support this type of research by developing a formal syllabus that outlines for the students how a research project is successfully conducted, which provides starting background materials, target products and timelines for delivery. For some students, a smaller project is a way to obtain useful skills or test interest, and in that case I have hired a number of hourly student workers to collect and process samples and data. Scientific research necessarily requires dissemination of the results of the investigation. So, in the writing intensive version of my course, students developed formal papers presenting the results of laboratory investigations. This process started with the use of a formal laboratory notebook roughly organized according to the elements of a research paper, including: Problem Statement and Hypothesis; Goals; Methods; Results; Interpretation; Conclusions. This writing involved two to three edited drafts, including a peer review which reviewed the manuscript according to a rubric and which was formalized in a “Letter to the Editor” summarizing the key issues in support of the rubric assessment. I have found that constructive criticism from a faculty member and from student peers can have very different and complimentary impacts on getting students to improve their drafts. In addition, the process of editing also helped students see where and how content can be obscured by imprecise language. Since the comments, letter to the editor, and rubric are also graded, they had to take the editing process seriously. The final assessments included both a rubric for the writing and organization and a separate rubric for the quantitative analysis, content, and logical development of the research problem. Outside the formal classroom structure, I am extensively available to students for both class related help, mentoring, and career advice. Within the Earth and Environmental Science Department we foster a sense of community and propagating that feeling of engagement requires my availability, my willingness to listen and participate in a dialog. This dialog largely involves making sure students are aware of options and guiding a discussion to help students address problems themselves. In a separate document in the supplemental teaching materials, I have included my thoughts on Mentoring, and which were part of my assessment for being awarded the College of Science and Technology Dean’s Mentoring Award.